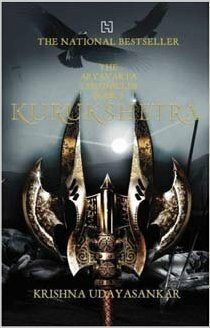 Presenting The Aryavarta Chronicles #3 Kurukshetra by Krishna Udaysankar. War is upon the realm, but is Aryavarta prepared for what will follow? As a bitter struggle begins to gain control of the divided empire that was once Aryavarta, Krishna Dwaipayana Vyasa of the Firstborn and the Secret Keeper of the Firewrights can only watch as their own blood, their kin, savage and kill on the fields of Kurukshetra. Restraint and reason have deserted the rulers who once protected the land and they manipulate, scheme and kill with abandon - for victory is all that matters. At the heart of the storm stands Govinda Shauri, driven by fickle allies and failed kings, to the very brink of darkness. Reforging the forsaken realm in the fire of his apocalyptic wrath, he is prepared to make the ultimate sacrifice of them all for the sake of one last hope: that humanity will rise, that there will be revolution. The spectacular, entrancing final episode of The Aryavarta Chronicles recreates the world of the Mahabharata with formidable power and imagination. The decisive battle between the Kauravas & the Pandavas. 'Kurukshetra' entitles the final chapter of the Aryavarta Chronicles following the previous 2 books 'Govinda' and 'Kauravas'. We have all grown up reading or watching Mahabharta on the television in all of its mytho-historical glory. Krishna Udaysankar not only held a cohesive plot till the end but also managed to tell this huge, complex tale without the mythos. Not a re-telling but more of a re-imaging can be observed as she tells a de-mystified version of the epic saga. Its the battle of the Firstborns (the sages) and the Firewrights (the scientists). The Divine Order and the right of democracy. Political greed and unholy desires. And the scheming of the court life. Not only does she manages to keep her story well paced through the thick and the thin but also gives rhyme and reason to instances and scenes of the tale that would have defied impossibility. No longer is Syoddhan (Duryodhan) the bad guy and neither is Dharma (Yudhisthir) the good one. Nothing ever exists in black and white, always the grey is there to shuffle things around. And that is what the author skillfully portrayed throughout the pages, taking instances from the text and churning out something that is reasonable and equally exquisite. It is not really necessary to know the story of Mahabharata before you read this series but it is beneficial to co-relate if you do. Much goes in the preparations of war. That is beautifully portrayed in the first half of the book as both sides scramble to acquire allies and troops for the war. The 18 days war was no less elegant and Udaysankar's play on words described all the nuances in stark details. Every maneuver, every formation, every action taken and the resulting deaths stood the test of courage. At heart this is a battle as i had already said between the Firstborns and the Firewrights, with the tale of the Kauravas and the Pandavas unfolding right along. Really the best conclusion afforded to the series. Krishna Udaysankar's Aryavarta Chronicles put to shame every other re-telling of the epic modern authors and playwrights have even hoped to put out there .... And the identity of the secret keeper is finally revealed. So there is that to look forward to as well in this glorious finale. I haven't heard of this series before. That cover really grabbed my attention though! Your review makes me think I'll go check the series out on Goodreads. Great review!